Hindu Samhati & FACT (Foundation Against Continuing Terrorism – New Delhi) to organise Ashru : An exhibition on the atrocities against the Hindus of Bangladesh. Hindu Samhati & FACT will organise Ashru (tears), an exhibition on the shocking persecution that has been and is being inflicted against the Hindus and other minorities in Bangladesh. 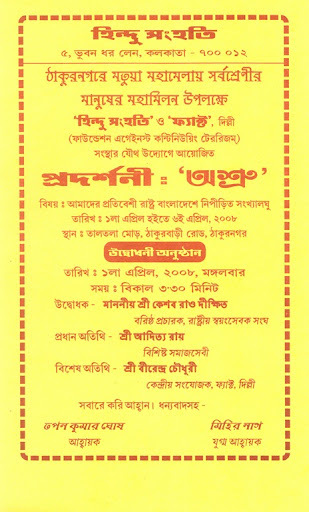 The Exhibition shall be held from the 1st till the 6th of April, 2008, at Thakurnagar, on the holy occasion of the birthday of Sri Sri Harichand Thakur – a great social and religious reformer of the 18th century and the founding Guru of the Matuya Sect (a Vaishnav Sect). Every year a huge religious gathering and celebration, involving hundreds of thousands of bhaktas, is organised at Thakurnagar in West Bengal on the occasion of the birthday (Janma tithi) of Sri Sri Harichand Thakur. 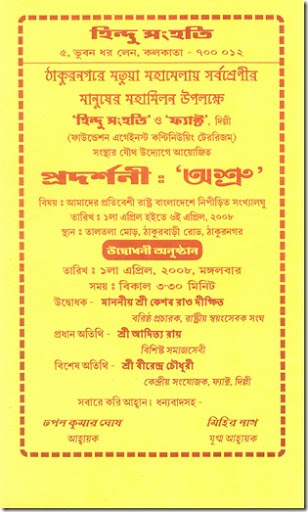 Below is the Pamphlet prepared by Hindu Samhati for this exhibition. 5, Bhuban Dhar Lane, Kolkata-700012. Subject: The persecuted minorities in our neighbouring state of Bangladesh. The Exhibition will be inaugurated by Sri Keshav Rao Dikshit, esteemed Senior Pracharak of the Rashtriya Swayamsevak Sangh.